Her mother, "Philippa", estimates that her daughter was placed in an isolation booth at her secondary school more than 240 times in total - beginning in year seven but becoming more frequent in years 10 and 11. She explained: "The room has six booths with a small workspace and sides so you cannot see other people. "You have to sit in silence and be escorted to the toilet which is embarrassing." On one occasion, Sophie said: "I begged the teachers to ring my Mum as I didn't want to be alone any more. "They refused and took my phone away, leaving me and a teacher I didn't know in an enclosed room." After she tried to take her own life, Sophie returned to school but said she would "dread each day" when she was again placed in isolation. "I would often have panic attacks and feel claustrophobic," she explained. "I feel as though isolation rooms should be banned. "They tend to make students feel isolated and helpless, knocking their self-esteem. "Due to the amount of stress and trauma throughout school I now suffer with depression and anxiety." Government guidance in England says schools are free to decide how long pupils should be kept in isolation, but they should be there "no longer than is necessary". The guidelines also say that in order for isolation to be lawful as a punishment it should be "reasonable" in all circumstances, and factors such as special educational needs should be taken into account. "When you're a lone adult with a class of 25 pupils, it only take two people to really persistently wilfully misbehave for that lesson to be completely detonated," he told the BBC in November. Philippa told the Victoria Derbyshire programme Sophie was now a "completely different child". Sophie has selective mutism - she did not speak until the age of eight - as well as autism, and can be "defiant" and "disobedient", her mother said - but this was "all part of her diagnosis". She added that Sophie - who "does not deal with change very well" as part of her condition - was "regularly" placed in isolation after she reacted badly to a change in teachers, classroom and routine. "Being isolated from her friends... made her become more internal - stop talking, stop communicating." 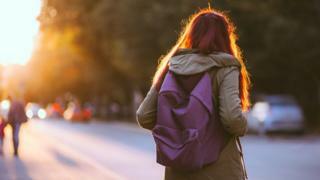 Philippa added that the school had also been aware of her daughter's plans to self-harm before she tried to take her own life, through a letter the teenager had written to them. When she discovered that Sophie had been in isolation booths - by now in year 11 at school - she said she felt "traumatised". "I can't even begin to explain how it makes you feel knowing every day I'd send her into the school and she felt that alone that she wanted to take her own life." The family's solicitor, Simpson Millar, have written to the government demanding action and improvements to isolation guidelines. Philippa said she understood the use of isolation booths in certain instances, but that it was not acceptable to use them as an "ongoing punishment". "It's causing severe mental health problems. Schools should be held responsible."